Welcome to Down On The Street, where we admire old vehicles found on the streets of the City That Rust Sorta Ignored: Denver, Colorado. We've seen quite a few Scouts in Alameda, but this one's older than all of them. 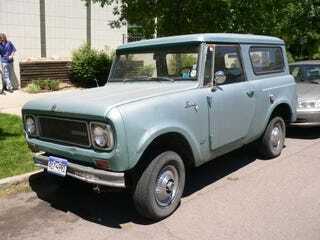 It's pretty tough for a non-farm-equipment-expert such as myself to pin down the exact model year of a Scout, especially with all the junkyard parts swappage that takes place with these things, but I'm going to say that the grille and lack of side marker lights mark this as a '67.